Thanks for joining us at Music Industrapedia as we construct our Beta Version in front of your eyes. This being a wiki site on the Global Music Industry means that we want you to contribute to this online Global Music Directory / Encyclopedia and online 'centre of the universe' for the Global Music Industry. This concept relies on its members to create its content, without your support it will be a long and slow development to get this off the ground. Please note that this is a work in progress and is only in its early stages of development at present. SO WHAT IS MUSIC INDUSTRAPEDIA? It is a 'wiki based' Global Music Industry Directory created by the music industry community. As a directory it includes several sub categories of the industry that cover every aspect of the music industry within every country and territory in the world. It is a 'Wiki Based' Music Industry Encyclopedia (similar to Wikipedia) of which the content is created by trusted members of the global music industry over time (i.e. it is a 'work in progress'). It is a Personal Profiling Site (with 'facebook like' social media attributes) for potentially everyone who works or has worked in the global music industry for networking purposes or just socialising. It is a Point of Focus to link all other web based content and links under a single roof relating to music artists, music industry people, music industry businesses and organisations, music products & services and music industry history and current information (like a central global directory for the music industry). It is a Space to Interact between fellow members of the music industry via forums, story telling, social media linkages and networking. And it is a Place to Discover other music artists, industry people, companies and organisations within a particular sub sector of our 30 key music industry sections / sub categories amongst the 269 nations and territories (or vice versa) represented in our extensive site directories (that you can either scroll through or search for). WHAT MAKES MUSIC INDUSTRAPEDIA UNIQUE? Because it is a 'wiki' in the nature of its structure, its role as a Global Music Industry Directory and Encyclopedia (built and maintained by the global music industry community) enables it to provide an engaging two-way (web 2.0) conversation around music industry directory and encyclopedic content creation. This is an alternative to the single individual or group of individuals who currently give you a one-way (web 1.0) static conversation around existing music industry directories and online encyclopedic content creation. Also, most industry directories are either based around a single nation (e.g. Australia, The US, The UK) or offer an elite global directory for a 'handsome price' with limited access to actual content submissions. 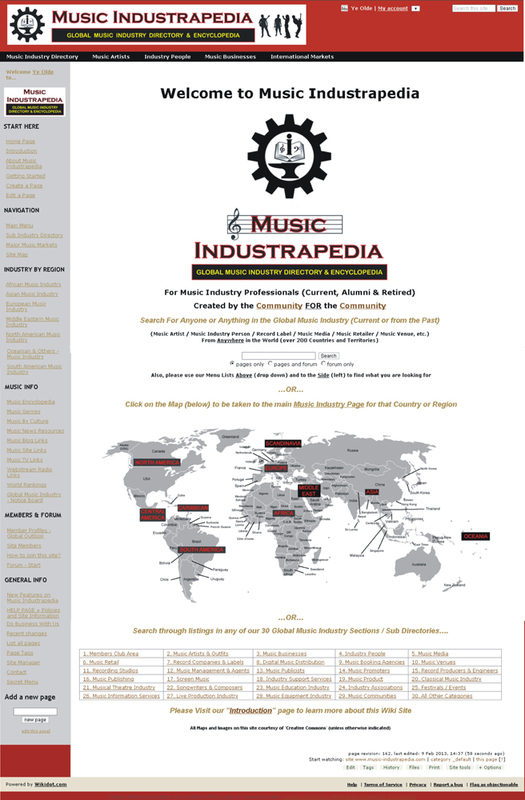 Our Music Industrapedia site will be absolutely free for anyone to view, and it is truly global (with every country and territory in the world covered) and will offer content contribution options to our members once that membership (as a trusted source via recommendation or on merit) can be established. WHO'S ON HERE / WHO WILL BE INVITED? The fact that your seeing this page means you've been either personally invited by myself to check this concept out because of your status as a music industry identity and / or because we've asked you to consider becoming a content contributor of the site. Later down the track we will be inviting our 4000+ Ye Olde Music Industry facebook members to also join us to contribute content. Most of these members either still are or have been major prominant music industry figures in the US, the UK and Australia ranging from record company executives to music managers to major musicians and much more. Music Industrapedia will be a 'Freemium' site. Most of it will be for free to all its users, but some features may attract a subscription fee for non VIP users. Anyone who has been invited early (and any of our facebook official record-companyarians) will instantly recieve VIP status and will never have to pay for standard or premium features. Some special services will attract a fee if you for instance commission us to create a unique Music Industrapedia page for you. Please note also that this is unashamedly a 'For Profit' site, so please expect to see over time commercial offerings and some 'on site / online advertising' to help pay for the costs of running this site. 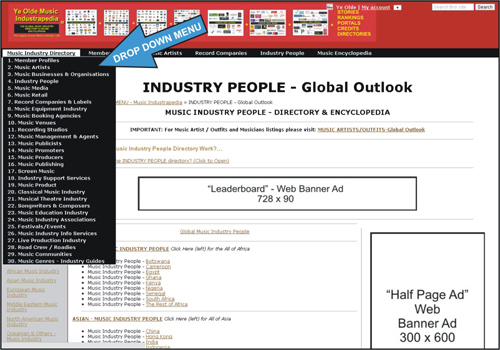 Music Industrapedia is best explored using top menus and the side bar menus. 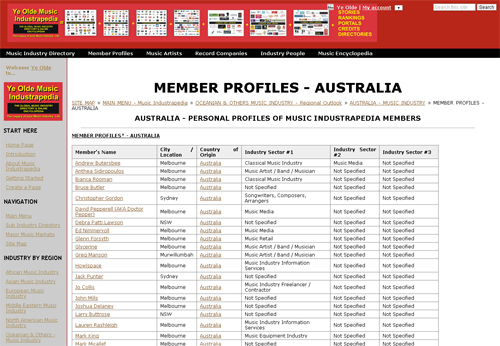 The top menu consists of a series of drop down menu's along the top of any page on Music Industrapedia (look for a black strip with white writing above - see sample image on the right of this paragraph) which includes the following drop down menu sections: Music Industry Directory, Member Profiles, Music Artists, Record Companies, Industry People and Music Encyclopedia. The Side menu consists of general sections such as START HERE, NAVIGATION, INDUSTRY BY REGION, MUSIC INFO, MEMBERS & FORUM as well as a GENERAL INFO section. These heading are self explanatory, but more information can be obtained in our Music Industrapedia Sections Guide. To email your ideas or written content please write 'NEW CONTENT' (create a new page) or 'ADDITIONAL CONTENT' (add to an existing page) in the subject line and email us at moc.liamg|skrowten.edlo.ey#moc.liamg|skrowten.edlo.ey We will usually have your content up on our site within 24 hours and will send you an email reply when it is created or added to. Writing a basic wiki entry is very easy (please visit our Getting Started page for full details or How-To-Edit-Pages page ). To write your own wiki entry directly please click on the 'edit' link in the bottom right hand part of the screen and then please feel free to just dive in and start creating pages or adding to existing entries. You may want to work on 'Music Artists' or perhaps 'Industry People' or perhaps any of the various Music Industry categories that can be found in the top drop down menus and side menus. Whatever your choice is fine with us. Please remember to click on the save button when you have finished your written piece and please add an explanbation of your work in the section provided (e.g. Established page for 'Dire Straits') in "Short Description of Changes". 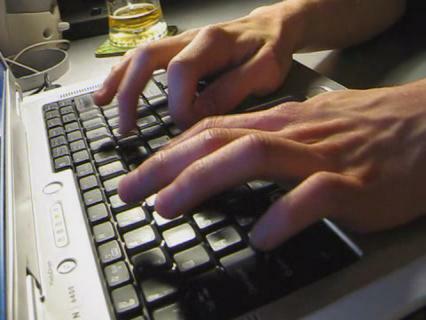 Please Dont Worry, we will clean up your wiki edit / page creation work and put them in the right categories and lists whilst you acqaint yourself with how content is structured on Music Industrapedia, all you need to make sure about is that you dont delete any existing work by writing over the top of it. If you can we would appreciate it if you can create a page in accordance to category rules to make our life abit easier. Please visit the Industrapedia Category Rules to learn how to do this. To contribute content on Music Industrapedia, please visit this link to learn about Getting Started. Thanks for being a part of this. I look forward to working personally with you on this ambitious project. PS: If you have any questions or comments about Music Industrapedia please click on the Discuss tab below and ask us a question or tell us what you think.